I used a yummy cracked-wheat sourdough for the croutons (and left the crust on), and they were just lovely. Also, I used a regular onion because it’s what I had, and it turned out great! Poaching the egg in this particular soup was super easy – there were so many onions, they just held the egg where it was supposed to be and let it cook away. Preheat the oven to 350°. In a medium saucepan, heat 1 tablespoon of the olive oil. Add two-thirds of the minced garlic and cook over high heat until fragrant, about 30 seconds. Reduce the heat to moderate and cook, stirring, until golden brown, about 1 minute. Add the onion and paprika and cook, stirring, until the onion is translucent, about 5 minutes. Add the chicken stock and bring to a boil over high heat. Reduce the heat to moderate and simmer the soup until reduced to 2 1/2 cups, about 30 minutes. Add the cayenne pepper and season with salt. Meanwhile, spread the bread cubes on a large rimmed baking sheet and toss with the remaining 2 tablespoons of olive oil and minced garlic. Season the cubes with salt and bake for about 12 minutes, or until golden brown and crisp. Crack the eggs into 4 small bowls. Bring the soup to a simmer over moderately low heat. Slide the eggs into the soup and simmer until the whites are firm and the yolks are runny, about 4 minutes. Ladle a poached egg and some soup into soup bowls and sprinkle with the chopped parsley. Serve the soup immediately, passing the croutons on the side. MAKE AHEAD The soup can be prepared through Step 1 and refrigerated overnight. This entry was posted in soup, vegetables, vegetarian and tagged onion, poached egg, soup by Laura Zolnoski. Bookmark the permalink. 2011 has also been the year of the poached egg for me 🙂 Have you seen the NY times series on poached eggs that they’re publishing right now? Definitely some dishes to add to your rotation. 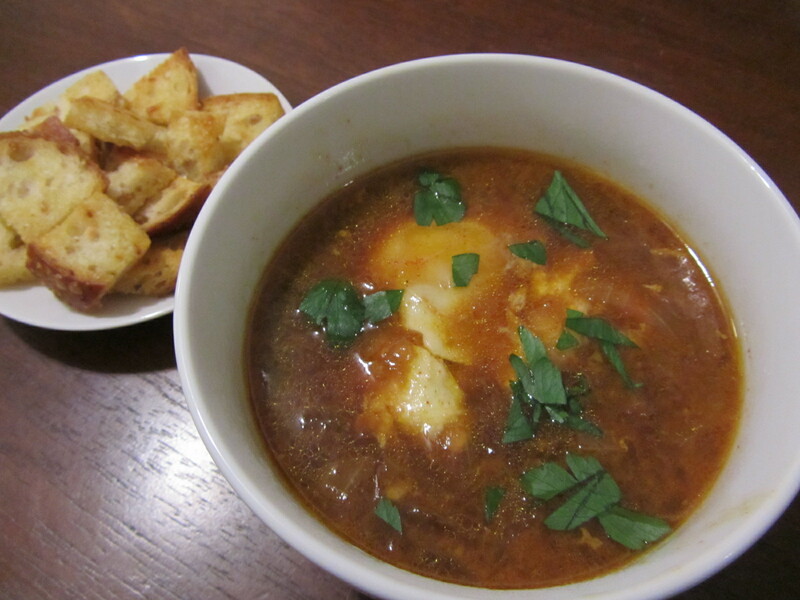 I’ve made an even simpler version of this sopa de ajo before with just garlic, water, paprika and an egg. I think I like the slightly more complex version better though; I’ll have to try this. Now if I can just keep my parsley plant alive! It’s the only one of my herbs that’s trying to die on me right now. Love the NY Times, and yes I did see those! I love the looks of the spinach and quinoa one. Let me know what you think of the soup, and good luck with your parsley plant. Our cilantro died mid-summer but everything else has been growing very well, thankfully!